Beyond providing extra workspace and storage, kitchen islands can serve as an important design feature of your eco modular home while also adding a social dimension to your kitchen. And, if designed right, a good kitchen island can completely transform a space – socially, aesthetically and functionally. Designing an island, however, can be overwhelming given the myriad of variables to choose from. From size, layout and position to colour choices and materials, there are a number of things to consider throughout the design development process. To begin, you’ll need to ask yourself: what is the main purpose of your island? Most of the decisions you make about your island will hinge on this question so it’s important to be clear on exactly what your kitchen needs and how you expect an island to enhance the space. Once you know what your island’s main functions will be, you can then move on to considering seating, storage, material and the like. Kitchen islands are an excellent tool for improving the efficiency and functionality of a kitchen. But they are not limited to simply adding bench or cupboard space. Depending on its design, an island can turn your kitchen into a social space by providing casual bar-style seating. The size and layout of your kitchen might mean, however, that you will have to make a choice between seating and storage. If your prefab home lacks a dining room table or if you’d simply like to turn your kitchen into a more social environment, seating might be an essential feature of your island. Most islands reserve one side for cooking and the other for eating but you can choose to incorporate seating on any number of sides of your island. 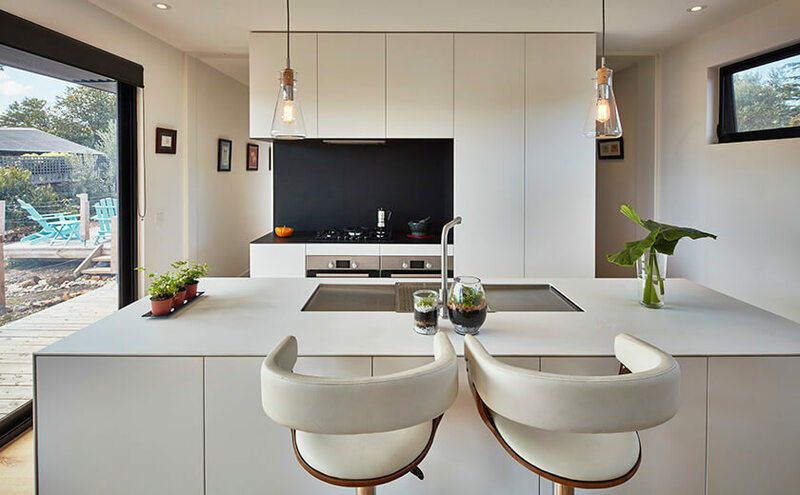 However, in order to comfortably arrange stools or chairs around it, your island will need to have an overhang of at least 30cm but optimally one between 38cm and 46cm. This will limit the storage capabilities of the seating sides of your island so again, you will need to reflect on what your island’s main function is: increased sociability or improving utility? If, rather than seating, your kitchen lacks storage space, a kitchen island is a great way to increase shelving, cabinetry and counter space. Island cabinets are great for storing crockery and cookware and for avoiding general benchtop clutter around the kitchen. And for aesthetic value, open shelving can provide the opportunity to display cookbooks and other cooking-related items. 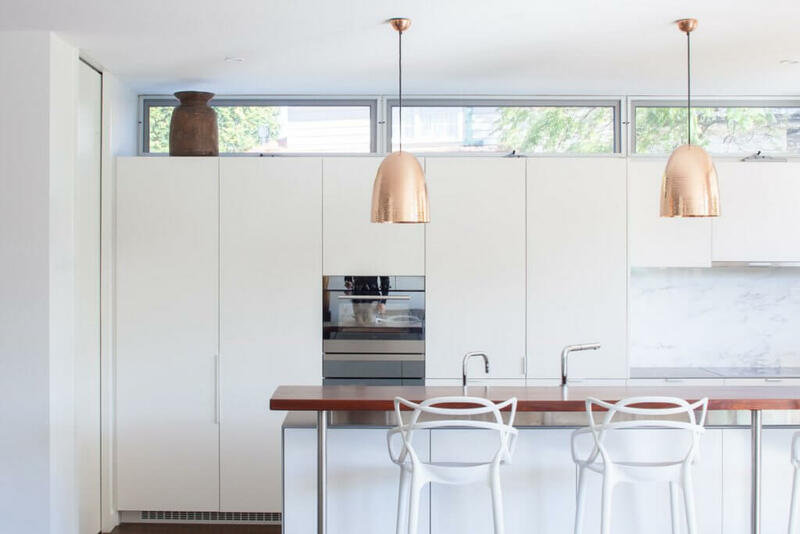 However, as mentioned, storage space may come at the cost of seating as cupboards and shelves won’t allow the overhang required to tuck stools beneath. Another fundamental design decision regarding your island is whether or not you’d like it to feature a sink or cooktop. Incorporating either or both of these appliances will impact other aspects of your island’s design so it’s once again important to consider the objectives of your island. If you intend for your island to be your primary meal preparation area then incorporating these appliances is a good idea. It can help distribute your workflow around the room while also opening up counter space in other parts of your kitchen. However, it’s important to note that these appliances are quite space-hungry so including them will affect your island’s storage capacity. For example, if you have a sink, you will most likely want a dishwasher positioned to its side and beneath the sink itself will be plumbing, which might otherwise have been storage. A cooktop will require ventilation installed above your island and so requires a significant amount of forethought. All this said, if you do plan to use your island for cooking and preparation, you will want to reserve some space to store your basic utensils for functional access. 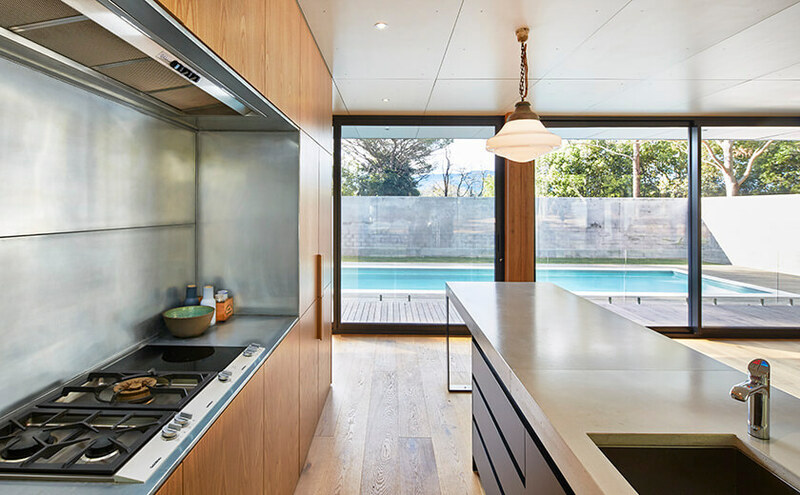 The material of your benchtop should not only be functional but should also direct or complement the design and style of your wider living space, so it is important to consider your options carefully. The best material for your kitchen island depends again on your island’s primary function as well as on your kitchen’s aesthetic, the overall design of your prefab home and your budget. Available materials include concrete, laminate, natural stone, engineered stone, stainless steel, timber, acrylic and marble but each possess their own advantages and disadvantages. Concrete is a versatile material to work with, available in a plethora of colours and patterns and can have either a raw or polished finish. It is more expensive than laminate, for example, but has a long lifespan and is quite durable in the sense that it is heat and scratch resistant. Concrete has some limitations, however. Its weight makes it quite difficult and costly to install and its lack of tensile strength restricts its thickness and overhang. And, although rather durable, it can still chip and crack quite easily. As one of the pricier materials on offer, natural stone boasts quite an opulent, high-end look with an organic and unique feel. It is durable but high-maintenance and somewhat restrictive. Natural stone is quite porous and so stains very easily. Choosing darker coloured varieties can minimise the visibility of stains but it is the paler colours that are more accessibly priced. And lastly, choosing natural stone will dictate the size of your kitchen island as you are limited to the natural pieces available. If you’re after natural stone’s brilliant character but need something more affordable and versatile then consider engineered stone. Made from combined resin, quartz or granite, this material offers a similar aesthetic but is far more resilient, less porous and is less restrictive in terms of size and colour. 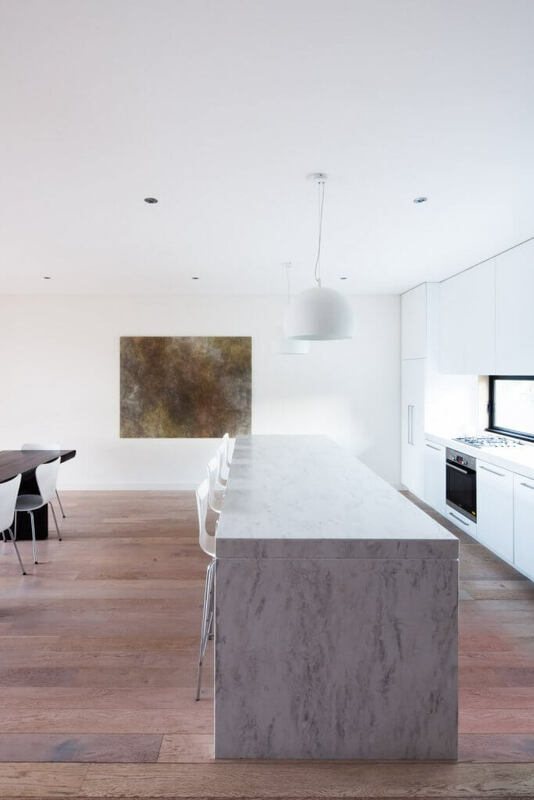 When planning for your stone benchtops you need to consider the slab sizes. If you have an extremely long benchtop (i.e. generally over 3m) be aware that you are going to have a join somewhere – this is unavoidable. It is important to know where the joins will be and feel comfortable with the placement of them before any fabrication of the stone begins. Timber is an extremely versatile material which is great if you’re looking for a very particular or organic shape and size. It can be made from a single piece or from a number of pieces put together. Opting for a more durable hardwood over softer varieties will improve the longevity of your island’s surface but timber, in general, is easily repaired as scratches and chips can be sanded off. And for a more sustainable house, there are many varieties of recycled timber to choose from. Stainless steel is extremely durable and low-maintenance, hence its use in most commercial kitchens. It can add an industrial or edgy feel to your kitchen but although it is stain-proof, it can highlight pesky scratches and fingerprints. Laminate is the most affordable material to choose from and is versatile in terms of colour and pattern. If the luxurious looks of stone or marble aren’t necessary for your kitchen, then laminate might be the low-maintenance, affordable and accessible material your kitchen needs. Easy to clean and install, laminate is a very functional and resilient. Modscape’s in-house design team can put forward suggestions that suit your spatial requirements, design style and budget. Visit our display suite, factory and finishes area in Brooklyn, Melbourne and talk to a member of our team about your next sustainable house design project.